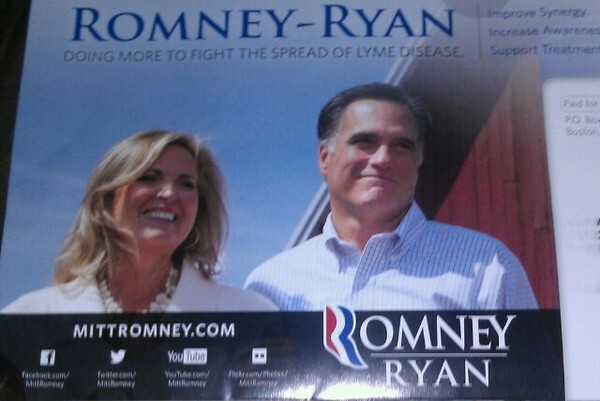 As it turns out, Romney is actually injecting himself into an intense dispute within the medical community, pitting the International Lyme and Associated Diseases Society (ILADS) against the Infectious Diseases Society of America (IDSA). IDSA believes there is “no convincing biological evidence” that Lyme is a chronic infection, while ILADS thinks there are flaws with the current testing system. Wolf and Smith have aligned themselves with ILADS, which is reflected in their bill and other public statements. Perhaps the campaign has some data that shows that this kind of targeted mailing will drive up his favorables among, say, middle class, politically moderate moms who like to hike. Or maybe they’re just trying to get under Obama’s skin. Update: The Weekly Standard‘s John McCormack has the full mailer. Find an unusual political pamphlet in your mailbox? Give us a shout: tmurphy [at] motherjones [dot] com.